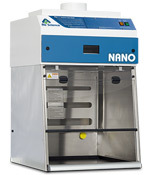 The Air Science® line of balance and bulk powder enclosures protects users by keeping powders, particulates and fumes contained during weighing procedures. The interior dimensions of the Air Science balance enclosures easily accommodate large micro and analytical balances. Balance enclosures are designed for weighing powders. Bulk powder enclosures are designed for transferring large quantities of powders to smaller containers. The Purair Advanced Series ductless fume hoods are available in 21 standard sizes. This Series of high-efficiency products is designed to protect the user and the environment from hazardous vapors generated on the work surface. The Purair Basic Series ductless fume hoods are compact, ideal for use in laboratory environments where space is limited or where only small volumes of harmful substances are handled. For package and mail inspection workstations, see Purair SafeSEARCH. Ideal for containment of powders and fumes during compounding or weighing, Vented Enclosures offer important safety features that are not found with any other competitive products. 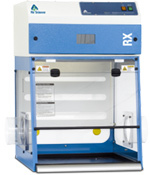 The Purair RX Balance Hood is a Class I enclosure that meets USP 800 requirements for non-sterile compounding procedures. Our line of balance and bulk powder enclosures protects users by keeping powders, particulates and fumes contained during weighing procedures. The interior dimensions of the Air Science balance enclosures easily accommodate large micro and analytical balances. Balance enclosures are designed for weighing powders. Bulk powder enclosures are designed for transferring large quantities of powders to smaller containers. Select one of our balance enclosure lines above to learn more, or contact us today for a customized quote based on your application.